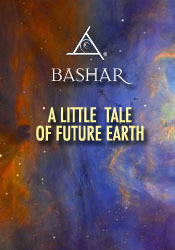 Bashar shares a story he calls "A Tale of Future Earth". Q&A: Deeper insight into the connection with Sirius and discussion of contact with dolphins. Bashar describes a symbol for use in connecting with Sirius consciousness. Can you tell me why I can't drink water? Discussion of detoxification of the body. What information is Bashar communicating in the harmonics of his voice? A dream of being aboard an extraterrestrial spacecraft. Why do so many civilizations visit Earth? Why has Bashar come to speak to this group? What is the significance of the year 2012 and Earth changes? What is the energetic cause of Alzheimer's Disease? Is there a way to help people with Alzheimer's? What can I do about physical back pain? Discussion of nutritional support through natural foods. Do humans have past lives in other civilizations like you do? Could you explain the mechanics of how the Merkaba operates for inter-dimensional travel? Further discussion regarding making physical contact with extraterrestrial civilizations. How can I learn to trust my higher self? How does astrology relate to our different aspects when we were born? Discussion of energetic cause behind the need for hip surgery. Making a spiritual connection with a dead relative.